...the best for heavy and extra heavy stuff! 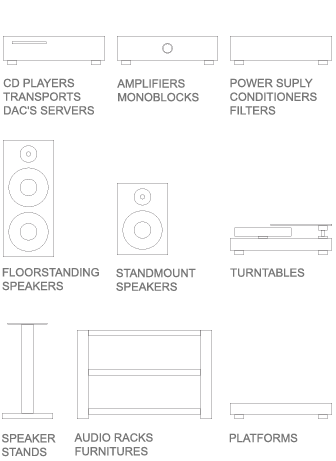 The Best for heavy and extra heavy audio components, speakers, turntables, stands, racks, platforms and audio furniture. Excellent for replacing original footers mounted by producers in audio components, speakers etc. Sophisticated CNC machining technology, carefully selected high grade materials and super hard ceramic balls guarantee the most effective suppression of unwanted resonances and best listening experiences. Wild range of addition screws (M6, M8, M10) allow to install ceramic disc fat foot in many possibilities and directly to audio components, racks, furniture etc. If your audio component/rack/speaker has their own spikes you can also install it at the fat discs without un-mounting originally spikes - just drop component with their spikes in to holes in the centre of discs. Sets of 3 or 4 feet, packaged in elegant black-satin box with protective foam insert. Finishing - black gloss, gold, other on request.